This year three of King’s students: Laura Galbraith (Remove), Lily Weir (5th) and Alastair Bolton (6a) took part in HSBC/British Council Mandarin speaking competition. They are all keen and passionate about Mandarin and competed with hundreds of candidates from around 50 UK schools. The initial heat was held on the 5th of December 2018 in three locations, due to the large number of entrants. In London, the competition was fierce amongst 150 individual entrants. Lily’s and Alastair’s performances impressed the judges in the initial heat and was very close to gaining a place in the final. Laura sailed through the heat and won herself a place in the final. 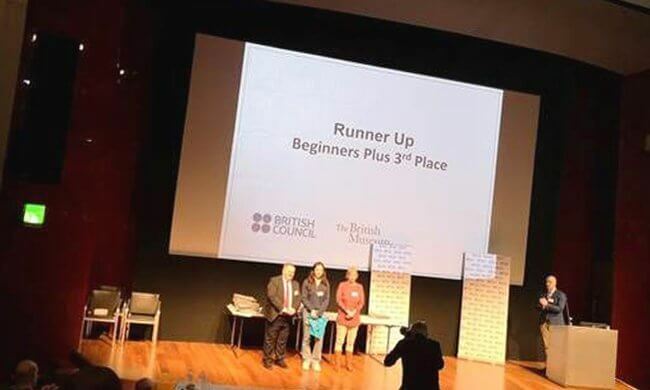 The final of the competition was held on 6th of February 2019 in the British Museum in London. Laura excelled once again among 9 of the country’s best Mandarin speaking finalists and won 3rd prize in the beginner’s plus category. Laura’s win is a clear manifestation of her hard work as well as the quality teaching by the Mandarin department.